Vista Radio would like to thank the people of Yellowknife for their amazing generosity this past weekend at CJCD Mix 100’s 7th Annual Holiday Food Drive. The turkey donations were a new element of the 2012 Food Drive that turned out to be a massive hit. By the end of the weekend there was also a fully-stuffed bus, packed from front to back and floor to ceiling with non-perishable food items. Afternoon Drive Host Jay Bear gave up a Saturday to host the 8-hour broadcast from the Yellowknife Co-Op. 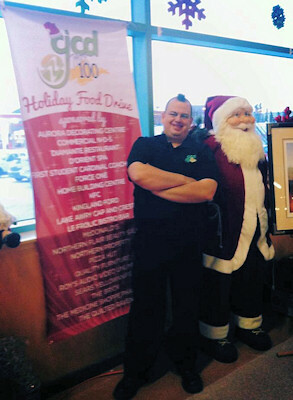 The Vista team in Yellowknife is looking forward to doing it all again for the 8th Annual Holiday Food Drive, on November 16th, 2013!